For these video-capsules, relevant actors related to the HEIRRI project or to the RRI in Education field got interviewed: Gema Revuelta, HEIRRI project Coordinator and Director of the Studies Centre on Science, Communication and Society from Universitat Pompeu Fabra; Roger Strand, Professor of Philosophy of Science at the University of Bergen, and HEIRRI Consortium member; Niels Mejlgaard, Director at the Danish Centre for Studies in Research and Research Policy at Aarhus University, and HEIRRI Consortium member; Ignasi López Vergeguer, Science Department Director Research and Knowledge Area at “la Caixa” Banking Foundation, and HEIRRI Consortium member; Jozefien de Marrée, EnRRICH project Coordinator at the Vrije Universiteit Brussel; and John Goddard, Emeritus Professor of Regional Development Studies at the University of Newcastle. The 1st HEIRRI Conference gathered in Barcelona more than 150 people from all over the world. It has been the first event organized with the purpose to discuss about the integration of RRI into university curricula. Professionals from various fields enriched the participatory debates with their inputs, which were all taken into account for the better development of the project. 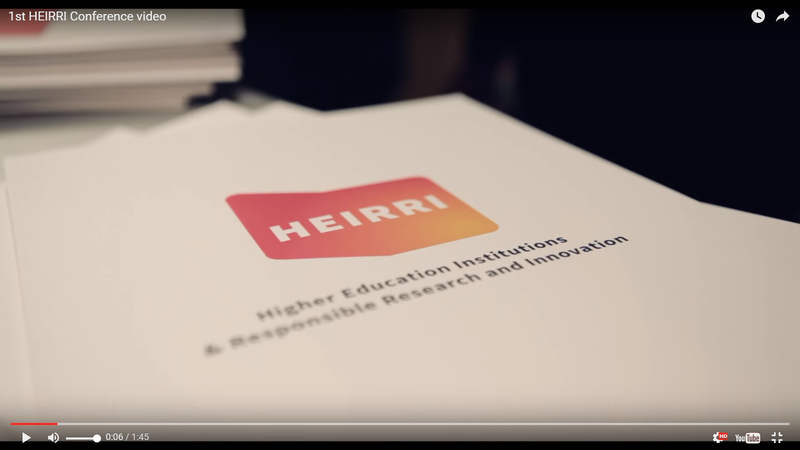 HEIRRI is a H2020 project that wants to promote the better alignment of the Research and Innovation system with the rest of society through the elaboration of education materials addressed at future scientists and engineers.